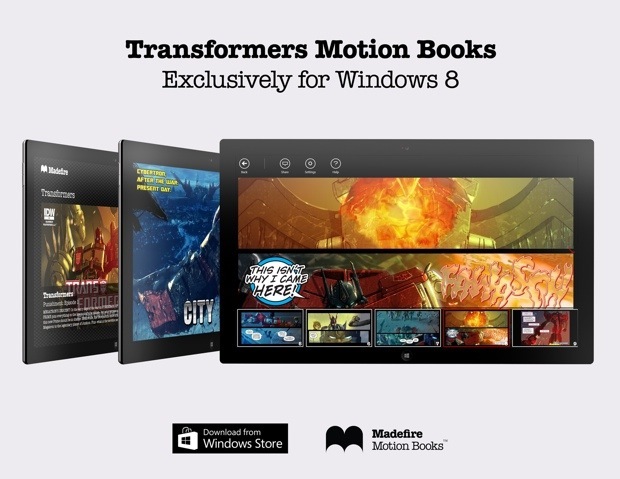 Madefire, the motion book publishers are set to develop their partnership with Hasbro and IDW Publishing by releasing 5 new episodes of the exclusive Transfomers: Punishment motion book through the Madefire app on Windows 8. These exclusive stories based on Hasbro’s iconic Transformers brand, will be available on all of the latest Windows 8 devices for no cost, and will provide a unique reading experience designed and built specifically for the digital screen. Transformers: Punishment is all-new original content developed within the current IDW Transformers universe with the creative team behind the five-part series comprising Transformers comic fan-favorites, writer John Barber and artist Livio Ramondelli.